Hello! 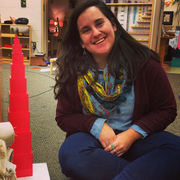 My name is Kate and I am finishing my Master's in Montessori Education at Xavier. I am an experienced childcare provider, having worked with 8+ families and 2 preschools, and have established 9+ years of providing care. My most recent position was as a nanny for 2 families (as a nanny-share) with 2 infants. I also have 7 years experience working as a camp counselor for children of all ages at private and non-profit camps, but particularly with elementary-aged girls in a residential setting. I have some classroom experience with the preschool through middle school years. I look forward to meeting families, parents, and kiddos of all kinds! Currently, I'm available on weekends only for babysitting and pet sitting: Friday nights through Sunday nights.